Fun, light and G-rated pages from Dan's family tree, sailing the Great lakes in old Cal Yachts, burning Ohio firewood, herbal cures, my humble opinions on several '70s Great Lakes sailboats, and muzzle loading ballistic charts . Click on any of the yellow buttons below to view more of our site's pages. One of my favorite sailboats. I've owned a Cal 2-27 for over 20 years. I've owned larger, newer boats but the cal 27 remains my favorite sailboats for the Great Lakes especially Lake Erie. Interesting information on burning firewood as a home heating aid. We've backed up our home's heating furnace with a firewood woodstove for over 40 years. Our ancestors used many different items to cure their ills. Hundreds of these items, or herbs, as people called them were developed into the medicines that we use today. Note: For information only. We do not sell or promote herbs here. Muzzle loading ballistic tables from my son and my experiences with Ohio muzzle loading deer hunting. This web page contains a complete Dalrymple family line from Andrew Dalrymple, born in Scotland about 1682, all the way down to my grandson, Brian. Click on any of the yellow buttons above to view more of our site's pages. Click links below to page down to correct paragraph . . . These links don't cover everything on this firewood page, please page or scroll up or down to see all. ~Do wood stoves hurt the environment? ~How do I "dry" firewood? ~What's best, fireplace or wood stove? ~My opinion on Outdoor Wood Stoves. ~What type chimney is the best ? ~Our home. Heated 90% with firewood. ~How much money can I save? ~Is burning firewood for me? ~Click here to see the best firewoods to burn. Note: This link will take you to another of our pages. This page will open in a new window, leaving our present page as is so that you may quickly switch pages. I've supplemented our home heating system for over 50 years with a wood stove here in northern Ohio. One cord of seasoned hardwood will provide more home heat than 225 gallons of propane, 2.75 ccf (2,750 cubic feet) of natural gas, or 133 gallons of #2 fuel oil. Compare your local prices for each. Page or scroll up or down for more . . .
Click here to return to index (near top of page) . . . Some consider wood fuel to be bad for the environment, however this is not the case if proper techniques are used. Firewood is a renewable energy resource like wind, solar and hydroelectric power. We need to use more renewable energy and less oil, gas and coal in the future. Heating with wood can be a part of the solution, provided the wood is burned efficiently. When wood heat replaces carbon-producing fuels such as propane, heating oil or electricity from a coal-burning plant, then wood burning has a positive impact on the world-wide carbon footprint. Today, important technological advances have resulted in cleaner burning, higher efficiency wood stoves. Many newer EPA approved wood stoves are over 85% efficient, meaning that over 85% of the heat produced by your firewood remains in your home. Wood stoves are safer and much more efficient than wood fireplaces. Most wood burning fireplaces are less than 15% efficient. Many people enjoy fireplaces for the comfort of watching a wood fire burn, however many newer highly efficient wood stoves have glass in the doors that allows viewing. ~ How large is our home? We heat 90% with Firewood. 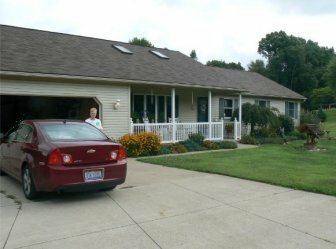 . .
Our 15 year old home is a large ranch with a full basement. I would guess the total square footage to be about 2200. Our original (present) heat is a Goodman 3 ton Heat Pump with a backup gas furnace (propane) that kicks on when the outside temp drops to below 40 degrees. We added the wood burning furnace and connected it into our existing Heat Pump/Gas furnace ductwork. Our home is well insulated, with over 18 inches of fiberglass in the attic. Our Hotblast 1500 heats our home in the coldest of Ohio weather. The Hotblast 1500 also keeps our garage warm. It's nice, during these Ohio winters, to jump into a warm car in the morning. Our Hotblast doesn't use much firewood but the firewood must dry. It must be be properly stacked and air dried for several months. We usually use 4 or 5 cords in a normal Ohio winter. Our chimney is Metalbestos, 6" double wall stainless with a ceramic refractory blanket insulation encased between walls. The flue is straight up, through the attic and roof. Our chimney is not visible in this photo as it's on the back (north) side of our roof. I burn Ohio's local firewoods including Oak, Maple, Hickory, Cherry, Elm, Locust, and Ash. I also buy several loads of slab wood from local saw mills, it dries quickly. I cut about half of my firewood myself. When I cut my own firewood I usually don't split anything that's under 10 inches in diameter. I use these large pieces to hold my fires overnight. These large pieces must be air dried for at least a full year, sometimes a couple years. Add a couple 7 inch x 20 inch Wild Cherries (or two 7" x 20" Elms) to a hot bed of coals, then put a good dry 8" x 20" White Oak, Locust, or Hickory on top and you have a fire that will heat for 12 or more hours and still re-ignite easily from the hot coals without a match. Photo above: Our back yard wood pile. This properly stacked wood pile will heat our home for two or three Ohio winters. This firewood is all cut 18 to 20 inches, split and stacked in 6 feet wide (3 rows), 5 feet high and 63 feet long. It's on top of a hill in full breeze and sunlight. This firewood stack holds a total of more than 14 cords. We usually burn 4 or 5 cords during one of our Ohio winters. Click here to see close-up. I always enjoyed cutting firewood in the '60s and 70s with my father. Burning firewood is not for everyone. Cutting and burning firewood requires costly equipment including chain saws, wood stoves, good safe chimneys and lots of time. I'm 77 now (2016) but I still enjoy working with firewood. Cutting, stacking and burning firewood requires considerable investment and takes time, however, it's good, healthy outside work. I work a while, sit and rest often, pour myself a cup of coffee, and enjoy watching the birds and animals. March 3rd, 2014. Four degrees above zero last night, and this is March! The winter of 2013/2014 was exceptionally cold in Ohio. (Where's all this Global warming when we need it?) Our home was toasty warm all winter but we burned over six cords of firewood last year. We normally only burn 4 or 5 cords. "Green firewood": Ever try to burn freshly cut firewood? Freshly cut firewood is called "green" firewood. It contains a lot of water. This large amount of water is not on the outside of the logs, it's inside, absorbed into the wood fibers. Proper air drying is the best way to remove this water from your firewood. This moisture exits the firewood mostly through the ends. This is why it's important to cut your wood into 18 to 22" pieces. Then properly stack the green firewood and leave the ends exposed to the open air for 6 months to a full year. Shorter logs will dry faster, I try to cut mine all about 18". Some green firewoods are more than half water by weight. Green firewood must air dry before it will burn efficiently. Firewood must be cut into short pieces, split and properly stacked to dry. Freshly cut firewood dumped in a discordant pile won't ever dry properly. Rain will run down and soak into cut ends while ground moisture will migrate up and soak into spongy inner bark. Wood left in a discordant heap will soon rot and be rendered useless as firewood. Firewood must be cut and properly stacked to dry. Burning "green" firewood doesn't provide much heat into the home. It causes more smoke and will coat your flue with creosote. Freshly cut "green" firewood has up to 60% water content and won't burn well in your wood stove. First, you must let the firewood "season", which allows the moisture to escape. When the wood gets down below 20% water content, it's ready to burn. When "green" firewood is burned, the water in the wood must be boiled into steam to get rid of it. Thousands of BTUs are used to boil the water out of the green wood. These BTUs are lost as home heat since it they are returned into the outside air as the steam returns to water vapor. Let's look at White Oak, a Excellent burning firewood when "dry or seasoned**". Here's an example of how much water is in "green" White Oak". 1 cord of "green" White Oak weighs about* 6,290 pounds. 1 cord of air dried White Oak weighs about* 3,710 pounds. If you must burn Green firewood, this means that 322 gallons of water must be boiled out of this "green" firewood before it can heat your home. Try to imagine how much heat is required to boil over 322 gallons of water. The heat used to boil this water is lost as home heat. How do I know when my firewood is "dry"? Firewood should be stacked neatly in a dry, sunny area so that air can circulate completely through the stack. Firewood should be cut into 22 inch lengths or shorter depending on your woodstove's firebox size. I cut my firewood all about 18 to 20 inches long. Shorter pieces dry faster. If you split firewood will it will dry a little quicker but splitting isn't absolutely necessary. Firewood dries mostly from the ends since this is the way that the water travels through the tree normally. Dry firewood should make a clear, sharp ringing sound when tapped together. Another clue is seeing cracks in the ends. Photo at right shows how firewood should look after being properly stacked and allowed to dry for a year or more. This photo is a close-up of the wood stack in my back yard picture (above). Notice the cracks in the ends of each piece. These are large pieces, 6 to 9 inches in diameter, 18 to 20 inches long. Tapping two of these together produces a clear, sharp "ring", not a dull "thud". This firewood is ready to burn. 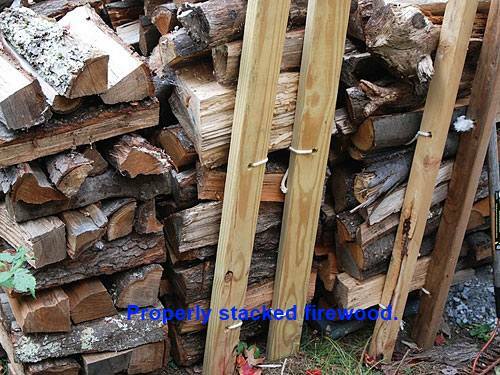 Firewood should be stacked in a sunny area where the breeze can circulate completely through the stack. The stack does not need to be covered. It's best to split and stack firewood soon after it's cut. This allows the wood more time to dry. Firewood dumped outside, in a pile will not dry, and will rot. Rain will run down and soak into cut ends while ground moisture will migrate up and soak into the firewood. Firewood left in a heap will soon rot and be rendered useless. Here's a quick drying trick if you're able to do it. My father taught me this trick. When cutting firewood in the summer while the leaves are healthy and still on the trees, fell the tree, leave all the limbs attached. Let the tree lay, with the leaves on, until they wilt away. This takes a few weeks but the leaves will pull most of the moisture from the tree. This will give the firewood a good start in drying. Note: The three pieces of Ash firewood at the bottom of the photo above were dried this way. Notice that the cracks in the ends of these pieces are much smaller. These Ash pieces are just as dry as the others, the quick drying trick above had removed most of the moisture before they were stacked. How efficient is your wood stove or fireplace? Click link below . 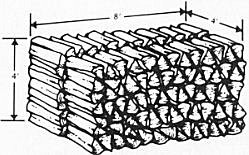 . .
Click here: Dry firewood weight by cubic foot. Weighing a single cubic foot of dry wood is a good way to determine the heat value in BTUs of the species as a firewood. Interesting, you will remain in this website. Almost all firewood will provide good heat, some is just better than others. If you have a choice of which firewoods to burn, look at this chart to pick the best firewood available in your area. Firewood Measurements: A single cord measures 8 feet long, 4 feet high and 4 feet wide or 128 cubic feet. 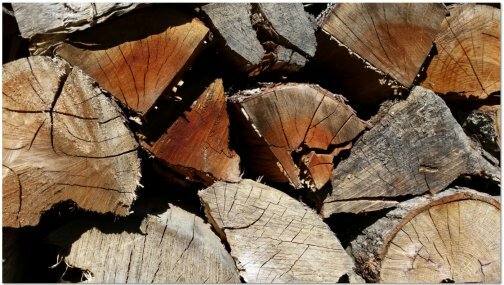 Remember: Just one cord of seasoned Red Oak, Hickory, or Ash will provide more BTUs than 225 gallons of propane, 2.75 ccf of natural gas, or 133 gallons of #2 fuel oil. Compare your local prices for each. Example: Today, 2/19/2014, propane is selling here in Wayne County for $3.78 a gallon. To purchase enough propane to equal a single cord of firewood (225 gallons, see above) will cost me $850.50 plus sales tax. I buy a cord of White Oak firewood slabs, cut to size and debarked, for $70. I buy it directly from the saw mill so I need to haul it, stack it, dry it, bring it inside and burn it. Using a propane furnace saves all this labor. I usually burn 3 to 5 cords of firewood per winter. By heating with firewood I can save over $400 per month during the winter months. Working with firewood isn't for everyone. However, if you enjoy working outside, it's well worth the savings. 1 cord = 21,000,000 - 24,000,000 BTU = 200-250 gal. of fuel oil or 2.50-3.00 ccf of natural gas. 1 cord = 17,000,000 - 20,000,000 BTU = 150-200 gal. of fuel oil or 2.00-2.50 ccf of natural gas. Firewood with Low heat output (Buckeye, Cedar, Cottonwood, Willow, etc.) 1 cord = 12,000,000-17,000,000 BTU = 100-150 gal. of fuel oil or 2.00-2.50 ccf of natural gas. ~What's best, a wood stove or a fireplace? Average fireplace, 15% efficiency (at best), my US Stove Hotblast 1300 has 65% efficiency. Some newer woodstoves are over 80% efficient. Wood stoves are very efficient at heating a room or home. Fireplaces are not efficient at all. This is because a stove is closed and controlled, whereas much of the heat output of an open fire escapes up the chimney rather than into the house. An average open fireplace will have an efficiency of up to 15 percent, but the chimney will cause a negative efficiency overall, as the fire in the fireplace burns down in the evening. The hot chimney will continue to pull air from the room, causing cold, outside air (called makeup air) to be pulled into the home. This results in a very high heat loss. What type chimney is best? Many people like to use the masonry chimneys that they already have in their homes. Many of these masonry chimneys are fine but they should be checked before they are used for a wood stove flue. Most of these masonry chimneys were installed for a gas furnace. Wood stoves have a higher flue temperature plus can also have creosote problems if you accidently burn "green" firewood. I added a stainless steel liner to the masonry fireplace chimney in my previous home. It then had much better draft and I felt more secure when leaving my fire burn overnight. What�s wrong with most masonry chimneys ? * Many are old and were not built to present day specs. * Most masonry chimneys over 10 years old should be checked by a qualified contractor. * Never use any chimney for more than a single stove or furnace. These outdoor wood stoves are very popular. On the good side, they are very safe. No fire or ashes are inside your home. These stoves burn about any kind of wood, wet or dry. However, most require a lot of firewood. The biggest reason that they burn a lot of firewood is in the way they burn it. These furnaces have two modes. I call one mode the "blast furnace" mode, the other is the "smolder" mode. Since water is used to transfer the heat from the stove into the home, the firebox is completely surrounded by water. This water around the firebox must not be allowed to boil as this could damage the firebox. When the water requires heat, an electric blower forces air into the combustion chamber like a blast furnace. This causes a lot of smoke and heat to exit up thru the flue. The fire must then be extinguished quickly before the water boils. So, when the water temp reaches about 180 degrees, the furnace shuts off almost all the air to the firebox. The fire shuts down, smoldering, until more water heat is required. When the water cools down, the "blast furnace cycle" starts again. Another way to demonstrate this . . . when my Hotblast 1300 is happily heating my home on a 30 degree Ohio day, the damper in my 6 inch flue is more than half closed. I could go up on my roof and hold my bare hand a foot or so above the top of the flue for a couple minutes without getting burned. This means that almost all the heat that is produced by the firewood is remaining in my home. Try doing this with an Outdoor Wood Furnace as it's heating on a 30 degree day. I'm afraid that you would be left with third degree burns on your hand. Now think about this? Is this large amount of heat that is exiting through the flue helping to heat your home? Several of my friends have Outdoor Wood Furnaces. There are times when these furnaces emit high volumes of nasty, black, smoke. They also burn at least twice as much firewood as I do, while heating similar size homes. They never seem to have problems with creosote due to the large amount of heat in the chimney. They have large fireboxes and only require stoking about two times a day, but remember, you do need to dress up and go outside to stoke them. Again on the good side, these stoves are outside with no smoke, flame or ashes inside the home. They burn about any kind of wood, wet or dry. They hold a large amount of firewood and only need to be stoked a couple times a day. They save their owners a lot of money in home heating costs. Most Outdoor Wood Furnace owners love 'em. This page last updated on May 07, 2016.